Can-Do stocks many colors, thicknesses, widths, and lengths. Please request a quote for the product that suits your application need. Read more information on carton sealing tapes. 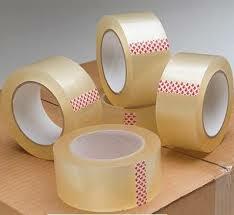 Let Can-Do personalize your packing tape system with printed tapes that include your company name and/or logo. Send a message to your customers when you use printed tape. You may select a wide variety of backings (from polypropylene, PVC and kraft paper to cloth or polyester), and you may select a wide variety of adhesives such as acrylic, hot melt rubber, or natural rubber. We will help you create your own custom product. Provide Can-Do with your specifications, and let us provide you with your desired custom printed tape. 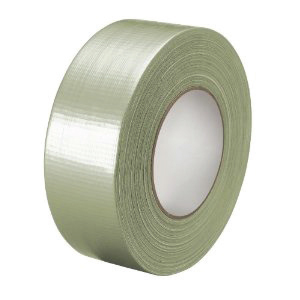 Gummed tapes have water activated adhesive systems and may be reinforced for added strength. 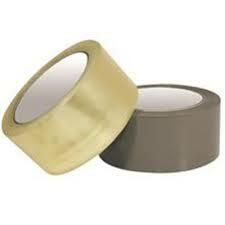 These tapes are typically 3″ wide and are available in 375, 450 or 600 foot rolls. 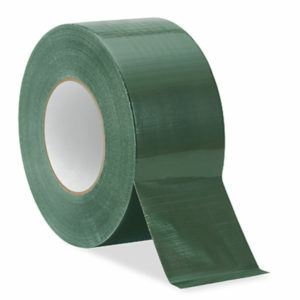 Label protection tapes are used to cover and protect labels. 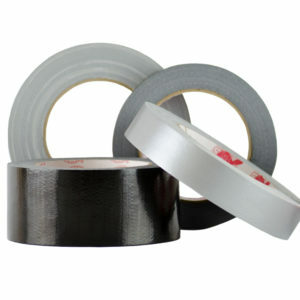 The tape is clear (center roll in picture) and will not yellow, dry, or crack. It cuts and handles well on our label protection dispenser. It is recommended for covering and holding packing lists and mailing labels that may be subject to rough handling.